Brackish water reverse osmosis equipment is tasked with purifying water and eliminating salts and other contaminates from many different impure sources. They have the power of blocking bacteria, particles, sugars, proteins, dyes, and other impurities that encompass a molecular weight of more than 150-250 dalton. Our largest tap and brackish water equipment, the BWRO-400 series, may come standard with media pre-filters, chemical dosing, and antiscalant. This equipment is primarily customized to suit individual customer and water application needs. The BWRO-400 Series is recognized as one of the most compact industrial reverse osmosis equipment in the market, it also claims state of the art energy saving membranes. When we design our BWRO-400 series industrial reverse osmosis equipment, we take into consideration certain matters such as robust construction, user friendly design, environmentally friendly materials, and long term reliability. 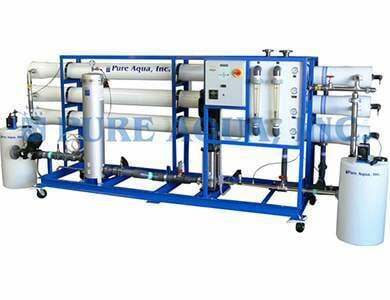 Industrial reverse osmosis machines include multimedia prefilters, a water softener, the reverse-osmosis unit with semi-permeable membranes, and a UV sterilizer post treatment. These machines apply the technology of reverse osmosis by transporting feed water through multimedia prefilters to take out huge particles. Then the water is transported into a water softener to remove hardness that may cause damage to the membranes within the machine. These pretreatments have the capability of removing hardness, chlorine, odors, color, iron, and sulfur. The water then continues into the reverse osmosis machine where a high pressure pump applies extreme pressure to the highly concentrated solution, separating the remaining salts, minerals, and impurities that the pre-filters couldn’t catch. Fresh, potable water comes out from the low pressure end of the membrane while salts, minerals, and other impurities are discharged into a drain on the other end. Lastly, the water is passed through a UV sterilizer to kill any bacteria and microbes that still exist in the water. As part of our industrial line, the BWRO-400 series machines can accommodate 28,800 to 172,800 GPD, with feed water TDS ranging from 1000 ppm to 5000 ppm. These machines come standard with media pre-filters, chemical dosing and antiscalant. Customization is available on all our units based on individual water application and customer needs.